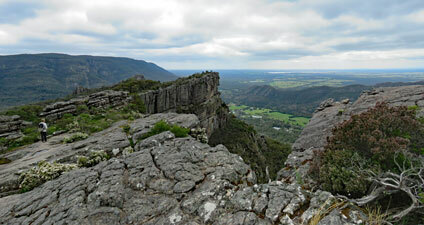 The Grampians have long been one of the country's major walking destinations. Not to be confused with the Scottish Grampians nor with The Pyrenees, which are either 50 km to the east of the Victorian Grampians or on the French-Spanish border (the explorers naming features in this part of Australia lacked a certain originality - if they'd only asked the locals they would have discovered that the name is Gariwerd and had been for many thousands of years). 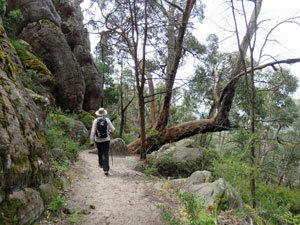 Why does a page of day-walks in the Grampians share a photodiary with The Great South West Walk, I hear you ask. Well, the answer is the Glenelg River, which near its mouth comprises one of the four major landscapes of the Great South West Walk. 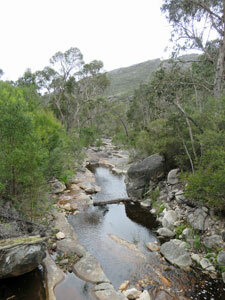 The water that you sit beside or canoe upon during that walk fell as rain upon the rugged ranges of Gariwerd some 240km upstream. 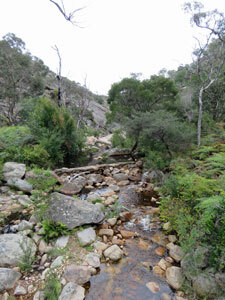 In flowing slowly down the river's course, this unites one of Australia's oldest walking regions with one of its newest ...... not a bad connection at all. 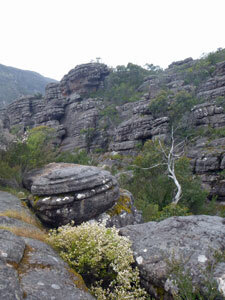 The Grampians also has history for us. Some thirty years ago, we stopped for a break here a few times on our way to Adelaide for a biennnial Christmas celebration with family. 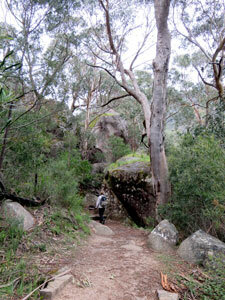 It was where my daughter did her first bushwalk. Thirty years is too long to stay away from the Grampians and so, with a family wedding taking us back to Adelaide once again, we decided to do a bit more walking in the Grampians. 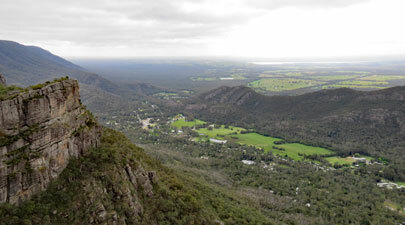 The most popular walk in the region is the so-called Wonderland Track which goes from a Central Grampians car-park past some of the better known landscape features and on to The Pinnacle Lookout. We had done this when we were much younger. It can be made longer, more interesting and more energetic, by starting in Halls Gap itself and returning by a different route to make a circuit. Now we are in our seventh decade, we finally felt fit enough to do this variant. Heading out from Halls Gap under a grey sky, we followed the well-engineered track, lined with an abundance of spring wildflowers, into the forest to reach a bridge that crossed Stony Creek. 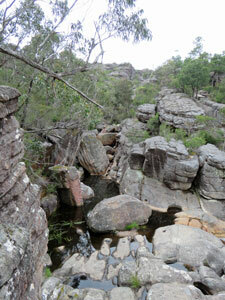 Upstream, the creek flowed across an enormous slab of rock, where over the millenia it had worn a series of shallow pools into the hard sandstone - welcome to Venus Baths. 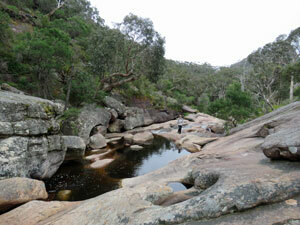 We sidetracked for a short distance to have a closer look at the rockpools, before heading on to climb up the tilt line of the bedrock high above the creek. 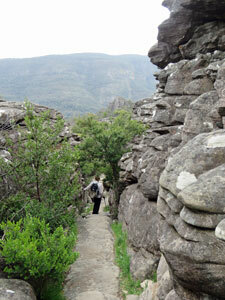 Behind, views opened up of the impressive walls of this entry gap into the Grampians. 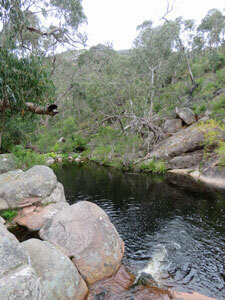 A short descent brought us back down to creek level, passing by a series of dark pools. 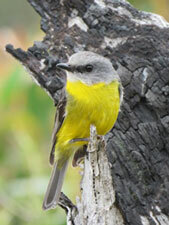 The whites, yellows, oranges, reds and purples of the flowering herbs and shrubs lit up an otherwise dull day. Reaching a track junction, we made another short detour to have a look at the impressive Splitters Falls tumbling down from levels above. Then, crossing Stony Creek by bridge, we continued our climb up its narrow and steep valley, passing more cascades and dark pools of water. 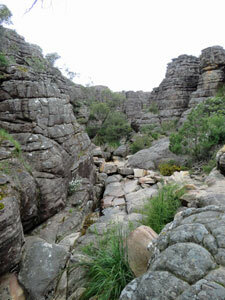 We had finally emerged from our entry valley to reach the western slopes of the Central Grampians. 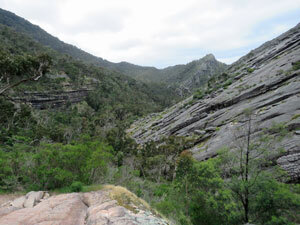 Here the tilted bedrock sloped steadily upwards to reach the cliff edges overlooking Halls Gap. 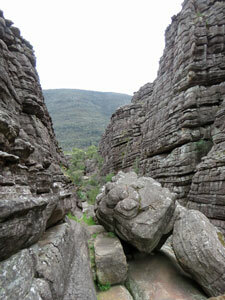 Our route upwards was via the Grand Canyon, an ambitiously named, but nonetheless imressive gash in the bedrock. 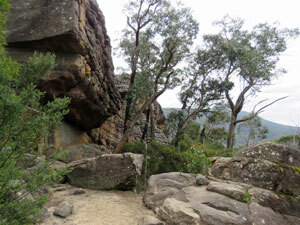 We wandered up between its elephant-hide walls of nobbly grey sandstone as far as a large rock fall that blocked the way. 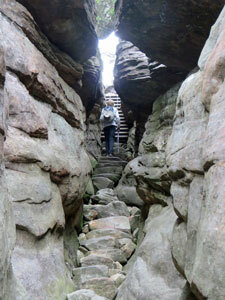 A set of steel ladders provided the exit point on its southern wall to bring us out onto the open bed-rock once again. 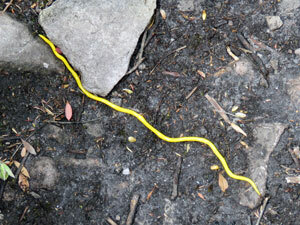 The onward route was across open rock, marked by the occasional yellow arrow and a long orange path, where the feet of myriad walkers had worn away the grey grime to reveal the true colour of the sandstone. 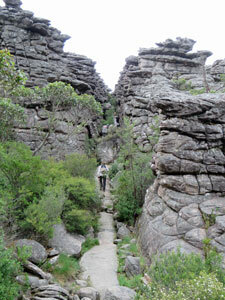 The climb continued, passing beneath rugged rock wall and down into narrow rock slot, until we emerged at the vertical drop of the cliff edge, 500m above Halls Gap. 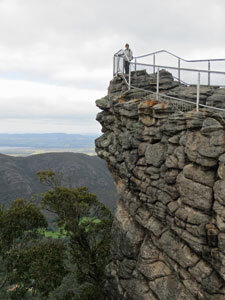 The Pinnacle, a promontory of rock jutting out into the void, provided a superb lookout over Halls Gap, Lake Bellfield, Mount William Range opposite and the farmlands beyond. 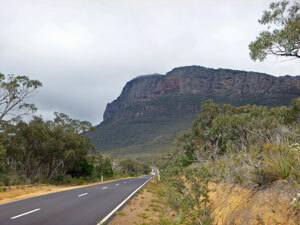 The route back to Halls Gap was more direct and quicker, but no less spectacular. For the first part, it followed the rocky slope, just behind the cliff-line, with gaps opening up every so often to frame view of the valley below. 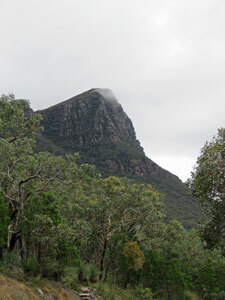 Eventually, the cliffs were replaced by steep wooded slopes and the track began a long traversing descent towards Halls Gap, aided by several sets of stone or steel steps. 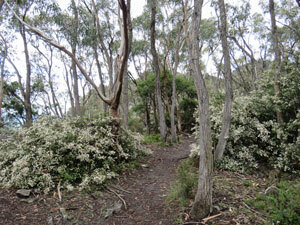 It was a pleasant, if knee-jarring, way down, under tall eucalypts, alongside orange and black walled cliffs on a wildflower-lined track, before finally rejoining the outward route for a short stroll back to Halls Gap. 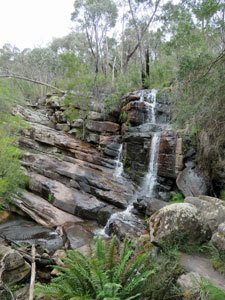 After more than 30 years, we were back enjoying the superb scenery of the Grampians once again. It had been way too long. 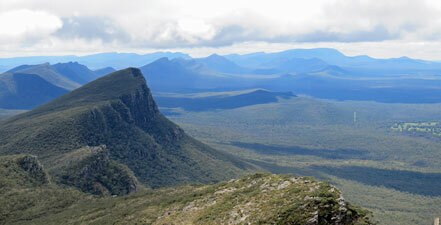 At 835m, Mt Abrupt is the highest point of the Serra Range, a long line of rugged peaks in the southern end of the Grampians. 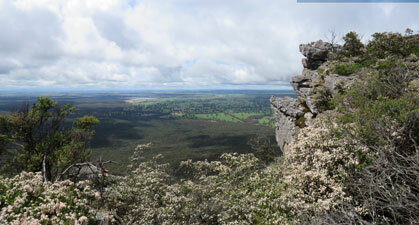 Only Mt Sturgeon lies further south before the Grampians fade away to the broad flatlands of Dunkeld. 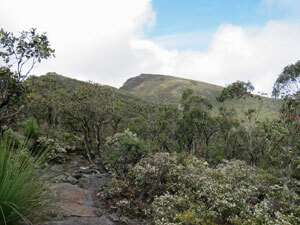 As such, it is a must to climb - on a short, but steep track that leads up the western ramparts of the range to the peak. 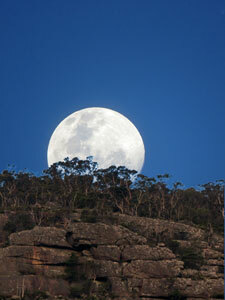 A half hour drive from Halls Gap brought us to the track head alongside the road. Looking up to the peak, the odd patch of blue was attempting to break through the broad expanse of grey cloud. Perhaps the sun would shine on us a bit more today. 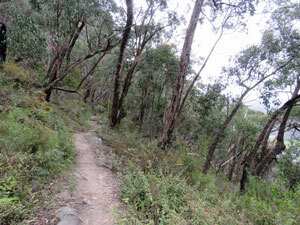 The track led quickly up into the forest on the lower slopes of the range, before turning north to gradually climb as it traversed the slope. 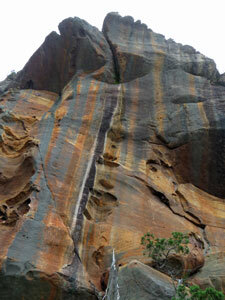 In 2013, massive rainfalls caused a series of landslides along this slope. New stone steps have been installed by Parks Victoria to cross the areas of instability - thus we crossed the landslides, continuing our ascent through the forest. Out to the east, the green pastures of the farm lands below began to appear through the trees. 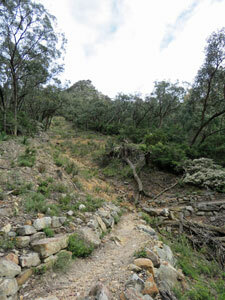 After a short while, the path came up against the rocky ramparts south of Signal Peak. 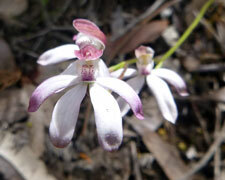 Turning west, the track now began to climb more steeply through the lush forest, its understorey shrubs covered with a haze of white star-flowers. The humidity levels were high and we were soon working up a good sweat as the track attacked the slope more directly, until with a final series of switch backs, we reached the ridge-line. 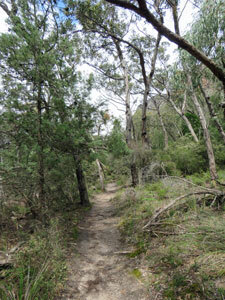 It was good to be walking on a relatively flat track again and good to be exposed to the cooling westerly wind. The wildflowers of the ridge were putting on a spectacular display as we emerged from the forest to wander along the narrow and rocky ridge-line. The views were equally spectacular. Out to the west lay the green pasture lands of the Victoria Valley, its lakes, swamps and wetlands glistening in the sunlight - yes, if only briefly, the sun had emerged to greet us on the ridge. 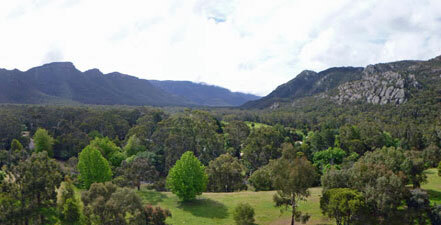 Backing the valley to the north-west, the silhouette of the like-named Victoria Range framed the horizon. 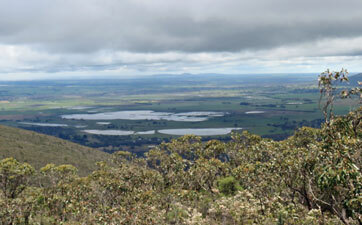 To the east, forest gave way to flat green farmlands disappearing into the distance, while the northern skyline was dominated by the dark pyramid of Signal Peak. 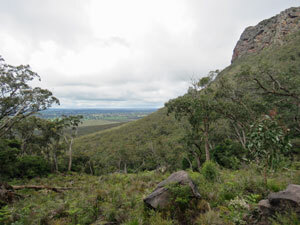 Ahead on the ridge, we looked up to the bluff shape of Mt Abrupt and its tiny trig. Gradually the path steepened as it crossed the rocky west-sloping slabs on the ridge, passing a series of gaps in the cliff-line that framed the eastern flatlands. All the time, the views behind to the north became more and more impressive, as the distant peaks of the Grampians appeared behind Signal Peak. 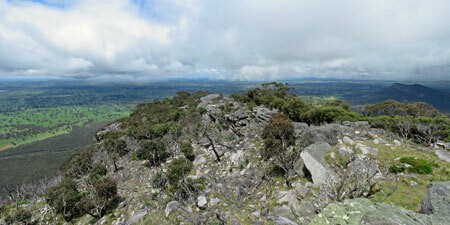 After one last steep ascent, we reached the trig on the top of Mt Abrupt and the views became a 360° panorama. They now took in the southern end of the ranges, with the dark shape of Mt Sturgeon almost hiding the distant village of Dunkeld. 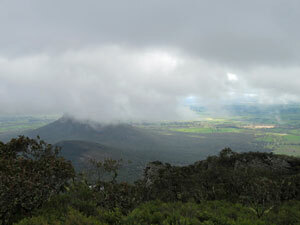 We ate our lunch as we took in the views and cloud and sunshine fought for the sky. 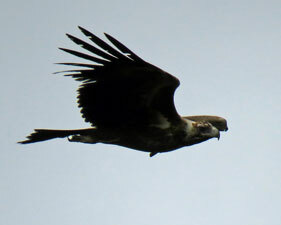 A pair of wedge-tailed eagles soaring high above the peak provided the entertainment - so much so that we barely noticed the icy westerly wind strengthen and the thick cloud band arrive, until we looked to the south and saw the cap of Mt Sturgeon swallowed by cloud. 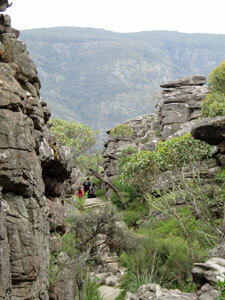 Quickly packing up, we scurried back down the path as the top of Mt Abrupt also vanished into the cloud. However, as quickly as the cloud arrived, it swept through and within 15 minutes, the last vestiges of mist were being swept away from Signal Peak ahead of us, an ethereal sight. It gave us the chance to finish our lunch in the sunshine enjoying the views from the edge of the cliffs. From there it was a matter of retracing our steps, down through the flowering shrubs and herbs and thick forest of the western slopes, back across the barren scars of the landslides and on to the car. 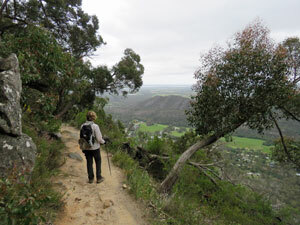 The walk may be short, but it is very rewarding - the panoramic views from the top of Mt Abrupt must be some the best in the Grampians.